When Tampa-based Dr. Kiran Patel became the first Indian American to make the single largest donation to an American institute in the US history by pledging $200 million to Florida’s Nova Southeastern University for healthcare development in 2017, we at Indian Eagle called the Indian American community a pillar of the US economy and innovation. Recently, Indian American Rattan L Khosa, the founder and CEO of AMSYSCO, Inc. at Romeoville, a Chicago suburb in Illinois has joined the club of philanthropic alumni in the US. 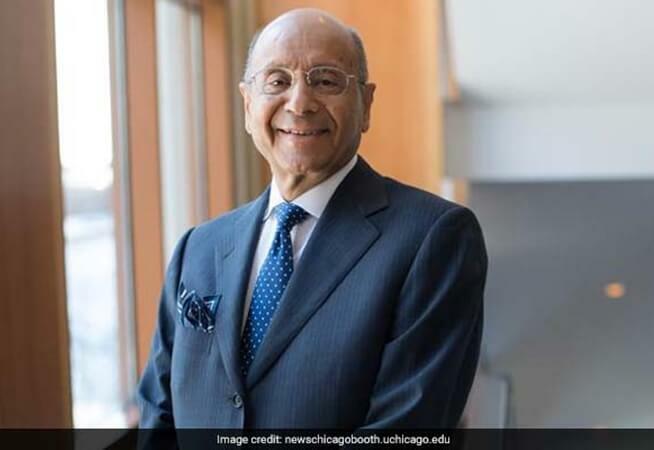 79-year-old Rattan L Khosa has gifted a whopping $5 million to his alma mater, the University of Chicago in order to help talented students pursue entrepreneurship and innovation. Reportedly, the university will utilize the donation to support the aspiring entrepreneurs launching business startups, with a multi-pronged program at the Polsky Center for Entrepreneurship and Innovation. The upcoming program for the University of Chicago’s student entrepreneurs will be named after him. Though Rattan L Khosa is not on the Forbes list of top Indian American billionaires, he has an interesting story to tell about his ‘American Dreams.’ When he came to the United States in order to pursue a research fellowship at the University of Maryland in the 1970s, he had only 3 dollars in his pocket. “The day I signed the check for the University of Chicago, I sat down still, closed my eyes, and recollected my first day in the US and how little I had,” he said in a nostalgic voice. He will not only fund the Rattan L. Khosa Student Entrepreneurs Program at Polsky Center but also don the hat of a thought leader and mentor to guide students throughout the meandering ways of entrepreneurship with his precious experience. “Plunging into entrepreneurship at the grassroots level is like jumping off a cliff in the thick of the night while blindfolded, expecting a safety net below,” he opined. He believes that his struggles, failures, successes and achievements will be real-life lessons on entrepreneurship to them. A major percentage of Rattan L Khosa’s $5 million donation to Chicago University will be used to award the winner of the Edward L. Kaplan New Venture Challenge at the university. At least $150,000 from the donation will be given to the winning individual or team in 2018. The award money will go up to $200,000 in the coming years. The award will be named Rattan L. Khosa New Venture Challenge First-Place Prize. A fellowship program will be instituted for two graduating entrepreneurs at the University of Chicago, with Indian American Rattan L Khosa’s gift to the university. Named Rattan L Khosa Entrepreneurial Fellowship, this program will provide a one-year-long stipend in three quarterly payouts alongside one-on-one mentoring which Rattan Khosa himself will be helming. With savings of $44,000, Rattan L Khosa launched AMSYSCO Inc. and operated the business from the basement of his home for a few years initially. Today, AMSYSCO is a highly profitable company at a 55,000 square foot facility in Romeoville, Illinois. It provides post-tensioning systems on commercial structures. A registered engineer in several US states, Rattan L Khosa majored in finance and marketing with MBA from the University of Chicago’s Booth School of Business. He pursued M.S. in structural engineering from the University of Maryland and graduated in science at the University of Rajasthan. he is on the board of directors for US-India Chamber of Commerce and a member of the Entrepreneurship Advisory Board for Chicago University’s Booth School of Business. Rattan L Khosa’s generous donation to the University of Chicago will help transform Booth School of Business as ultimate destination for aspiring entrepreneurs in not only Chicago but Illinois. This story is part of our continued effort at Indian Eagle to promote good work for noble causes by Indians in USA and the rest of the world. We not only strive to offer last minute flight deals for US to India travel but also cater inspiring stories, community news, and travel updates to Indian Americans through our free newsletters.